You love your school and you want to show it. This is the perfect way. Nowhere will you find the total collection of theses, so I thought I would put them together. 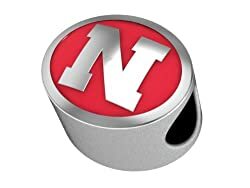 The full collection of Nebraska Cornhuskers Charms to complete any Huskers fan’s Pandora Bracelet. When you walk into Memorial Stadium in Lincoln, everyone will know that you are a Husker. 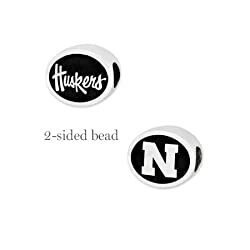 These Pandora Bracelet Charms representing the Nebraska Cornhuskers are made to fit most of the different styles of charm bracelets that are so incredibly popular right now. 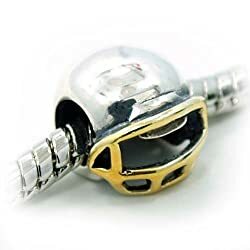 If Herbie Husker had a Pandora Bracelet, he would have every Huskers charm listed on it. If you can’t be at the stadium watching the games, make sure where ever you are they know who you represent. Scarlet and Cream are your colors? Then that Pandora charm bracelet needs a little more of those colors. 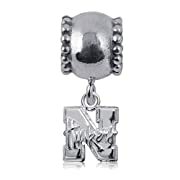 With the big N logo for Nebraska, this Nebraska Cornhuskers Pandora charm represents for any sport in the University. 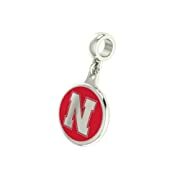 This charm has the N in scarlet on one side and has the all so familiar Huskers written on the other in a cream background. 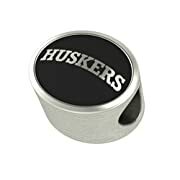 The perfect Charm for Huskers fans everywhere. You want her to represent your team just like you. well this is the way to do it. What women doesn’t like jewelry? So if she can cheer by wearing the team logo, then grab it for her. She will love it. 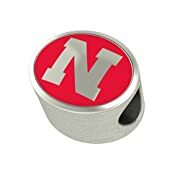 If you like a dangling Pandora bracelet charm, this Nebraska Huskers charm is the right one for you. 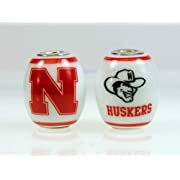 With Huskers on one side and the Nebraska N on the other just like the bead above. 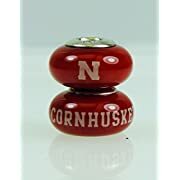 A perfect gift for the lady Husker in your life. You have always wanted her to be a fan, but couldn’t find the way to do it. She won’t wear the shirts, not girly enough. She doesn’t wear hats, so whats left? Jewelry! Get her some fan based jewelry. She won’t turn that down. A beautiful bracelet that just so happens to have some school representation on it. 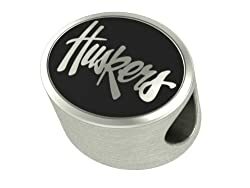 If you have a color scheme on your Pandora Bracelet, then this Nebraska Cornhusker charm is the one for you. 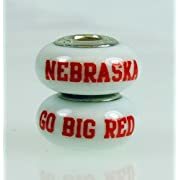 Represent your Huskers and keep the current colors on your bracelet. So if you love pink or purple or any other color, then you need to show your loyalty in a color free method. this is the way to do it. Add a silver charm to your bracelet. 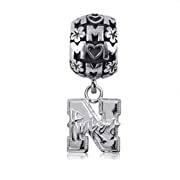 University of Nebraska Pandora Charms are available from a few different suppliers. This Charm is similar to the one above, but from a different company. This one is double sided and has the logo and on one side and the name on the other. So if this is your school, or you home and you want to show the world that this is who you cheer for, this is the way to do it. Grab one of these or grab them all. Either way, it’s about your school!! Are you a fan? Do you have the bracelet? Let us know. Even if it’s just to say you RULE! Add your two cents in.